Yeah Godzilla: Unleashed has the most perplexing "story mode" of any tournament fighting game I've ever played. A: Mothership crashed and humanity and earth monsters fighting full force. B: A even battle between man and alien. C: A "hard mode" where you have to fight extra hard against the aliens. There can be several big, major moments in the story and even some minor moments that can be influenced, such as the previously mentioned Mothership attack or Spacegodzilla trying to get himself back onto Earth. Ideally, the best Godzilla game possible and the one with the most appeal to non fans would be something in between the Atari games (Destroy All Monsters Melee, Save The Earth, Unleashed) and Super Smash Bros. In the Atari games, particulary Save The Earth and Unleashed, you unlock monsters by buying them using in-game points if I'm correct. I feel like that takes away from all the fun and the potential, because like Super Smash Bros, you could instead try to unlock these monsters by playing the campaign or multiplayer after winning a match, encountering them unexpectedly at certain points in the game when you're playing and then forced to beat those monsters in order to unlock them (for example, unlocking King Ghidorah after playing 10 VS matches or unlocking the male MUTO after beating the story mode on hard mode). That's another thing; Unleashed is in my opinion the worst of the Atari games but has the biggest roster of monsters, which allows more variety and fun, especially if you're playing online or local play with other people. The Godzilla PS3/PS4 game that came out recently, despite being bad, finally introduced Hedorah, who's full of possibilities as a fighter. That's just the gist of it, but it can happen if KOTM and Godzilla vs Kong prove to be not just successful but popular among the eyes of the general public. Would any of you be in for a FP Godzilla game? LegendZilla wrote: Would any of you be in for a FP Godzilla game? FP as in "First Person"? I'm going to give you the benefit of the doubt here. How exactly would that work in your idea? You play as Godzilla destroying a city as usual, but only this time, you play from a First-person perspective. Oh, okay, I thought there might be like a cool hook or something to it. Yeah, no, not interested at all. Hope that never happens. That'd make for an excellent VR experience, I think. That I would agree with. VR would be really cool. I'm not sure an entire game of that would be, though. Feel like it would get really old really fast and be super disorienting. The only close thing that we had Godzilla and VR was that Shin Godzilla VR demo on PlayStation VR, but it was just a demo. Think Xenogears (PS1) ... but with Toho Mechs (Mechagodzilla, Mechani-Kong, etc. ), and human/humanoid characters. Yeah? A PSN/Xbox Live MonsterVerse fighting game would be cool. With KOTM coming, if you just scaled up the K:SI monsters you’d have a decent enough roster. ( put in tags 'cos MG doesn't do anything in his normal form) Do you guys think Toho will ever allow Anime Mechagodzilla to be a playable character? I mean we know all of his abilities thanks to the second novel, so I guess the developers could wing it on how his weapons operate and appear. Last edited by MechaGoji Bro7503 on Thu Jul 19, 2018 11:37 am, edited 1 time in total. A cross over with Super Robot would be awesome. 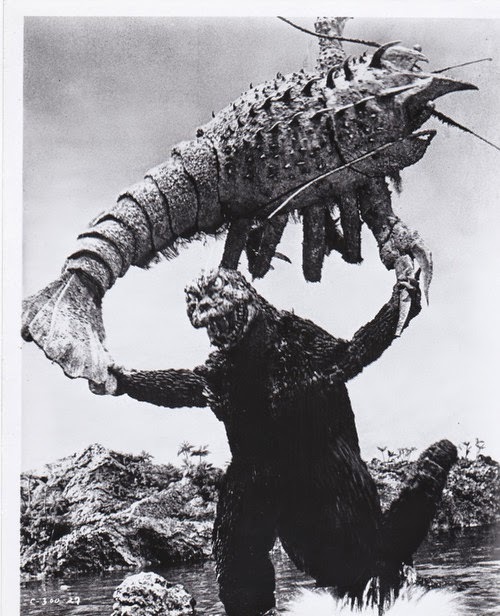 KaijuCanuck wrote: A PSN/Xbox Live MonsterVerse fighting game would be cool. With KOTM coming, if you just scaled up the K:SI monsters you’d have a decent enough roster. Same here. Give me a fighting game with the Mutos and the rest of the Monsterverse. Wouldn't mind waiting till GvsKK in case anything else is in the film. I'd like to see a Godzilla fighting game on the Nintendo Switch. I am so tired of Godzilla fighting games. I've seen so many and they get stale after a while. I would like to see a game company come in and shake things up. A game with a large roster of monsters but from the human perspective would be nice. Playing as a member of "G-Force" or some other such group. Perhaps working on foot or in vehicles like the Super X or Gotengo. And not just fighting monsters, but exploring the lairs of various monsters with the goal of learning more about them, how to fight them, etc. I'm no game developer. So I can't say how you could make something like that work. I just know what I would like to see. And it definitely isn't more fighting games. I want a game that is halfway between the 2015 game and the old Pipeworks brawlers. Easier, smoother controls with a proper move system, but slower, weightier gameplay.